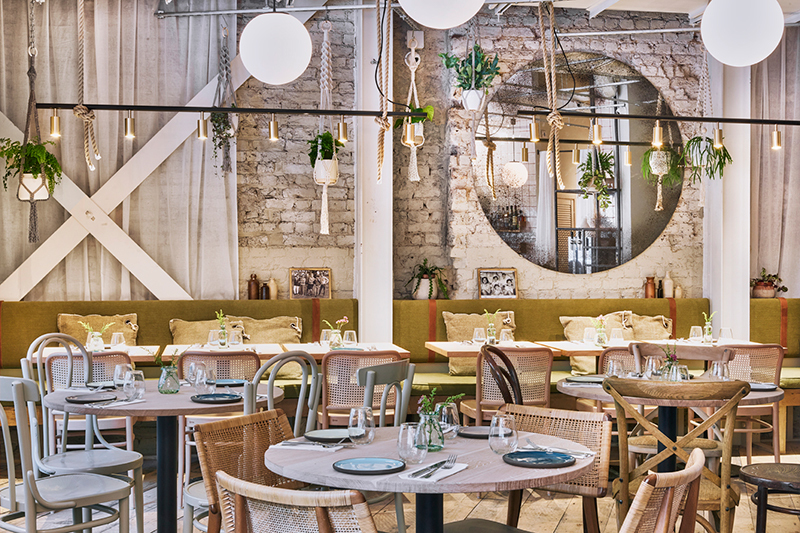 With its mix of white-washed exposed brick and natural, handmade textures (think mismatched rattan chairs, rope baskets trailing greenery and weathered wood finishes), Delamina provides a stylishly muted backdrop for a menu that is, by contrast, vibrant in colour and explosive in flavour. The Levantine restaurant is the brainchild of husband and wife Amir and Limor Chen and their partner Ray Kelvin, the team behind health-focused turkey eatery Strut & Cluck. Now bringing their creative take on eastern Mediterranean faire to Marylebone Lane, Kelvin and the Chens (new band name?) deliver a selection of scrumptious veggie-based plates (black sesame-smothered baby aubergines topped with a salty crumbling of rosemary goats cheese, anyone?) alongside larger fish and meat mains, most of which are served sizzling from the charcoal grill. We kick off with a plate of warm, fluffy pittas, ready to dunk in smokey aubergine, tahini and zhoug (that’s a spicy cilantro sauce originating in Yemeni cuisine, for the uninitiated) and a charred head of cauliflower, heaped with heavenly lemon zest-infused tahini. It’s a prime example of Delamina’s preference for taking a humble ingredient and pimping it to the hilt with contrasting textures and aromatic seasoning. The grilled courgettes with labneh drizzle, crispy onions, pine kernels are another case in point. 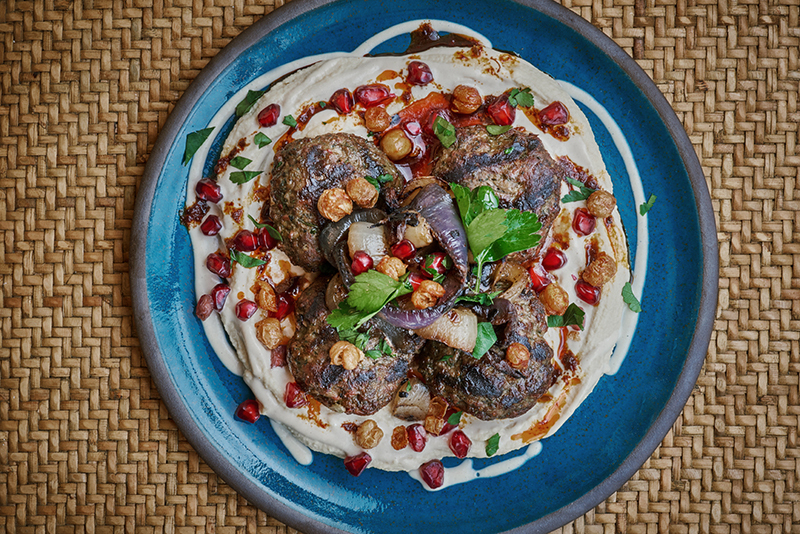 A highlight from the grill is Moshe’s koftas, with tender chunks of venison and juicy angus beef laid over a bed of grilled onions and the creamiest hummus, studded with jewel-like pomegranate seeds. Seafood lovers will adore the pan-seared squid, too, with its summery accompaniment of crushed roast tomatoes, piquant caperberries and crispy cavolo nero (a sexier variety of kale). A bottle of the medium-bodied Viognier-Chardonnay-Muscat – plucked from one of the most acclaimed artisan Lebanese wineries – pairs beautifully with the smoky flavours, and forms part of Delamina’s succinct and diligently sourced wine menu. Too stuffed to take on the delicious-sounding flourless chocolate mousse cake, we finish instead with a dessert cocktail. The bonfire of vanities is rather like an espresso martini with a childhood twist – almond milk, espresso, Kahlua and Baileys, served with a torched marshmallow. Despite its relative youth, the Delamina experience is that of a well-established restaurant: assured of its identity and accomplished in its execution. This is thoughtful, unpretentious Levantine cooking that brings together old world charm and contemporary flair. 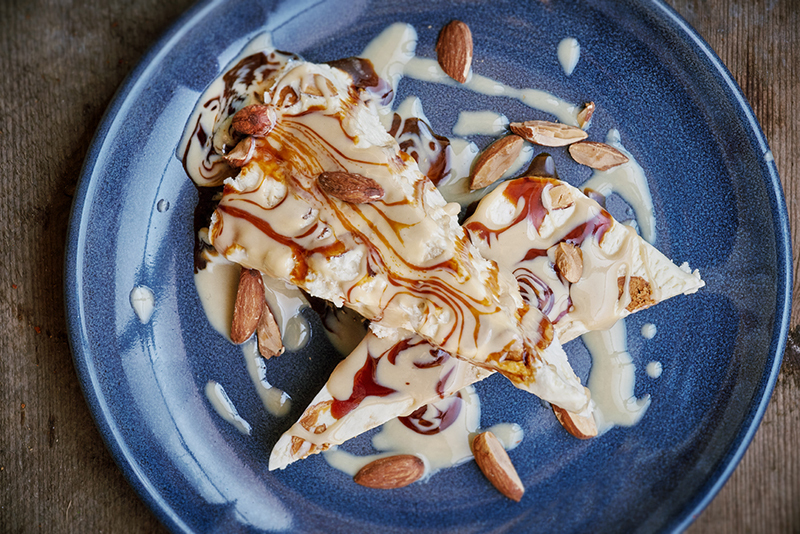 Go – and exercise enough self-mastery that you save room for the almond parfait.